Just after being nominated Portia said ‘Just had some amazing news, I’ve been nominated for Community Coach of the Year Award at the Bucks & MK Sport Awards 2015. The Redway Runners teams for this year’s Squeaky Bone Relay are below. The race is on Sunday 1 November and starts at 10am at Spring Lane, Clifton Reynes, Nr Olney MK16 5DS. The first named runner in each team is the Captain. Please can Captains pick up the registration pack for the whole team on arrival at the race tent? Runners must run in the order below. There are prizes for overall men, ladies, mixed and vets (+40 male & female) teams. Team categories are included below. There will be a Redway Runner Team photograph at about 0945. It is suggested that all entrants arrive at the site soon after 0930 at the latest. We have no reserves at the moment. If you cannot take part please let me know as soon as possible and we’ll see if we can find a replacement. Tea, coffee and cakes are available so spectators are encouraged. Good luck and see you all on Sunday. This year’s Christmas Party will be held on Friday 4 December at 7.30pm at David Lloyd. Tickets are £25/head or £20/head for vegetarians. Please book through Martin Lawrence or Julie Martin – payment by bank transfer (Sort code 301553 Number 42390360 Name; Redway Runners), cheque (Redway Runners) or cash. Send your menu choices to Julie Martin. Payment and menu choices secures your place. A raffle in aid of our club charity Bravery Boxes will be held on the night, any raffle prizes would be gratefully received. The usual merriment will ensue, with a late bar and a disco until 2am. Disco only tickets at £2 each are also available but limited to a maximum of 50. 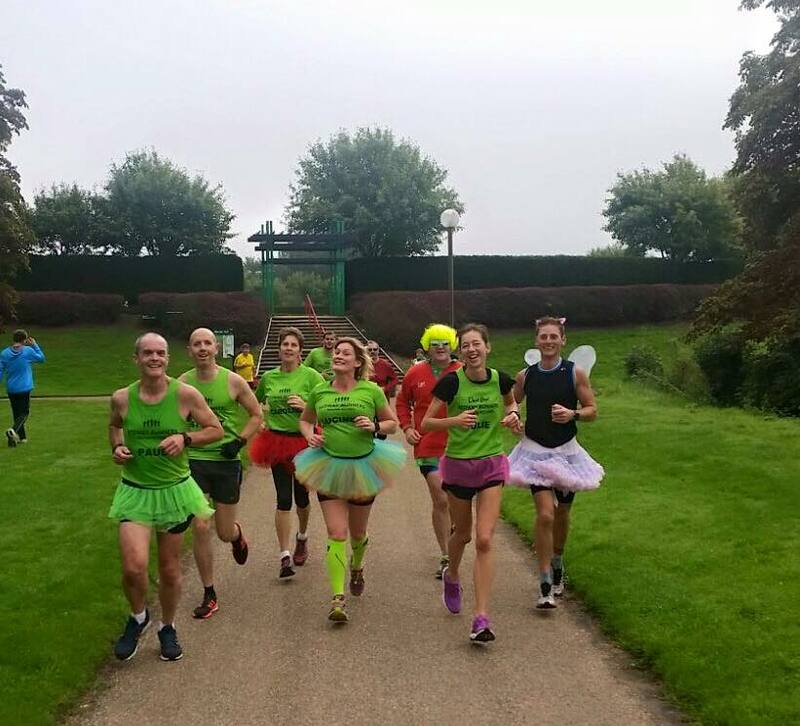 This last weekend saw a fantastic turnout by Redway Runners at many events around the UK. 24 runners took part in the Cardiff Half Marathon. Aidy Maidment was the first Redway Runner home in 1:26:45, closely followed by Martyn Douglas with a new PB of 1:26:58. New personal best times were also recorded by Paul Newton, Sarah Jane Bird, Chris Amesbury and Jennifer Sangster. Maeve Fox (2.07.43) and Mandy Hockley (2.25.47) ran their first ever half marathons in very credible times. 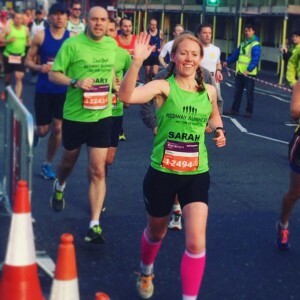 Over 25 runners took part in the Bournemouth Marathon Festival. Jamie Farmer was 14th in the Marathon with a time of 2.49.24. New personal bests were recorded in the half marathon by Terence Childs, Sarah King (Pictured below), Jonathan Clements, Neil Solanki and by Patryk Galardziak in the 10km event. Tony Dalglish finished first in his age group at the Tissington Half Marathon and Abi Gooch came 6th lady in the Blenheim Half Marathon. In multisport events Nicole Clarke finished 1st lady in the Buckingham Triathlon and the National Duathlon Championships at Oulton Park saw Jane Ritchie win the gold medal in her age group and Kevin Orchard record a personal best time whilst finishing 7th in his age group. 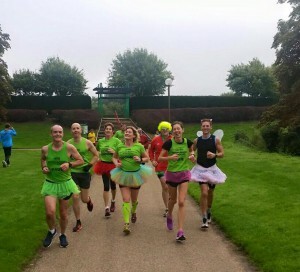 MK parkrun saw a large number of Redway Runner personal bests this week including Genci Pepaj, Andrew Dodds, Simon Baker, Mike King, Helen Whalley, Greg Tappenden, Zaid Alani, Victoria Wells, Jeanne Barby, Jane Hammonds and Theresa Randall. And finally a special mention for Lucinda Parish who ran the MK parkrun in sub-30 minutes, which was her goal after ten hours of cancer-fighting surgery in July. Lucinda was fundraising for the National Hereditary Breast Cancer Helpline. Well done to everyone. New members are always welcome – come and join the other 800 members of all abilities to get fit and enjoy yourself. Another fantastic club trip over to Wales this time for the main event being the Cardiff Half Marathon which is the biggest race in Wales and the third largest in the UK behind the London Marathon and Great North run, the event was fantastically well organised and on a lovely route. Some of us also too the opportunity to do the Cardiff parkrun on the Saturday morning.